In six months a new hurricane season begins and if unofficial predictions are correct the 2018 season could be worse than the extremely terrible 2017 period during which Hurricane Maria's destruction set Dominica back more than fifty years. Understandably Dominicans are already scared and therefore our psychologists and psychiatrists must be prepared to undertake a series of immediate mass counselling exercises to help Dominicans cope with a hurricane or tropical storm that may or may not affect the island before the next season ends. But the best way to cope with these increasing devastating natural disasters, made worst by the climate change phenomenon, is to prepare like we have never been prepared. And we are not advising individuals to step up on preparations but government as well. For instance, a few weeks ago we were not only surprised, but also pleased with his candour, to hear Mr. Lloyd Pascal, a government employed environmentalist, say rather forcefully, that the nation does not have hurricane shelters - we have buildings that are designated as shelters but we do not have appropriate hurricane shelters. The 2018 hurricane season will be especially painful for Dominicans who have not had the opportunity to build back better, as the government slogan suggests, because rebuilding after Maria has not been as easy as we have been led to believe. Dominica is still a major tarpaulin country and most of the country is still without electricity and internet. And that condition, for a large number of Dominicans, could continue for a few years. Let's all pray for minimal wind and rain during the upcoming season. 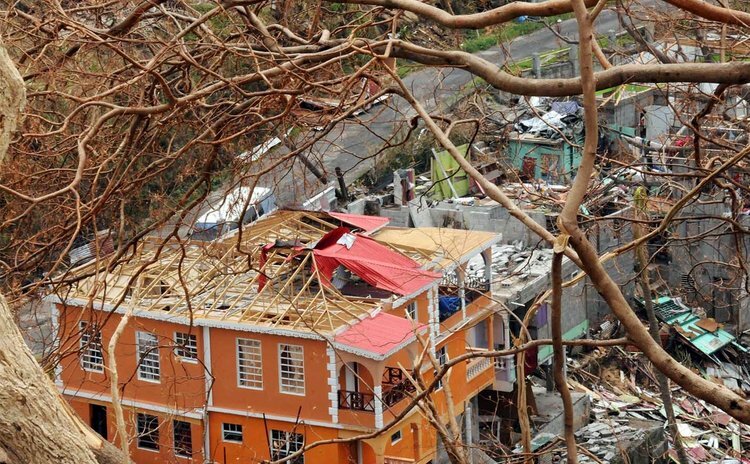 Apart from Hurricanes Maria and David, recent events illustrate the fact that despite its traumatic experience Dominica is not adequately prepared for even the mildest of natural disasters. The two incidents are the collapse of the dam in the Layou Valley and the widespread flooding of Mahaut and Massacre after a few showers in 2011. In an article published recently, Severin McKenzie, an architect who has experience in disaster risk management, concluded that the disasters of 2011 mentioned earlier were essentially man-made and could have been avoided. "While most persons were admiring the effects of the disaster I was interested in the cause," McKenzie wrote. "I stopped at four locations; first at Canefield next to the airport runway, then by the old Ware House Disco, then Checkhall and finally in Massacre. That was enough, there was one common denominator for the cause of damage at all the sites visited; obstructions in waterways, culverts were inadequate, debris stuck under bridges, bridges constructed without consideration for the free flow of water. In summary, the cause of the destruction was nothing more than poor construction practices". Over the last decade hurricanes have done untold damage to the agriculture and tourism sectors in particular. But given our experiences over the years, the most traumatic being Hurricane David in 1979, TS Erika in 2015 and Maria in 2017, one would expect Dominica to be much better prepared for the impact of hurricanes and other natural disasters. But most islands of the Caribbean, including Dominica, seem to have adopted a fatalistic attitude towards hurricanes and other natural disasters. Hurricanes blow our way every year anyway and landslides in Dominica seem to be everyday occurrences we seem to have concluded, so what can we do about them. But we are wrong to think that way and based on our record of poor management of hazards, Dominica may be in for a rude awakening. The point we wish to make is that our laissez- faire attitude to disaster management is not due to a lack of knowledge and experience; we seem to be devoid of the political will to take the necessary action to be better prepared for the impact of natural disasters caused by hurricanes, landslides, earthquakes and volcanoes. It would appear that we give serious thought to natural disasters only at the point when disasters are about to strike but during the rest of the year we ignore essential institutions such as the Office of Disaster Preparedness, the Red Cross and the Planning Department. In fact, the national budget which governments present every year to Parliament hardly ever mention disaster risk planning and the need to reduce the impact of natural disasters. In spite of the fact that hurricanes have become a statistical certainty in the region our governments have not prepared as adequately as one would expect. For instance, adequate insurance coverage for the tourism sector, or for any sector for that matter, is still a major concern. Additionally for decades agricultural economists have suggested various insurance schemes for agriculture, the life blood of our economies, but our efforts to implement them have been sporadic and inadequate. WINCROP, the Windward Islands banana insurance scheme, has died along with the banana industry. But what about plantains, poultry, pigs and coconuts? Even after Maria, few people are talking about that type of insurance scheme. We chat about resilience in agriculture but insurance for poor farmers who cannot afford high premiums dare not claim to be resilient without adequate insurance systems. As for national medical insurance, coverage for farming seems to be a programme to be undertaken by the Organisation of Eastern Caribbean States (OECS) and even CARICOM.